Pursuant to 28 U.S.C. § 48, a panel of the Federal Circuit Court of Appeals will hear oral arguments at Washington & Lee University School of Law in Lexington, Virginia, on Wednesday, March 23, 2016. Oral arguments will begin at 10 a.m. in the Millhiser Moot Court Room. In accordance with routine practice, the names of the panel judges will not be released prior to the morning of scheduled arguments. Additional information will be available on the Court’s website at the Arguments/Upcoming Arguments tab. Back in 1994, the year I began practicing patent law, the Federal Circuit dealt with the contentious issue of “panel stacking” by the Commissioner in the case of In re Alappat. The en banc Federal Circuit approved of the panel stacking practice in that decision. MAYER, Circuit Judge, with whom MICHEL, Circuit Judge, joins, dissenting. I do not agree that we have jurisdiction over this appeal. The Commissioner exceeded his statutory authority in convening a new, expanded panel to reconsider the board’s original decision in Alappat’s appeal from the examiner. Because the Commissioner’s acts were not in accordance with law, the reconsideration decision cannot be a “decision of the Board of Patent Appeals and Interferences” within the meaning of 28 U.S.C. § 1295(4)(A) (1988), and this court has no jurisdiction to address the merits of the appeal. See In re Bose Corp., 772 F.2d 866, 869, 227 USPQ 1, 3 (Fed.Cir.1985) (an improperly constituted board may not render a valid decision over which this court may exercise its review jurisdiction). As the Supreme Court has said, “A court-martial [for which we may substitute “board”] is the creature of statute, and, as a body or tribunal, it must be convened and constituted in entire conformity with the provisions of the statute, or else it is without jurisdiction.” McClaughry v. Deming, 186 U.S. 49, 62, 22 S.Ct. 786, 791, 46 L.Ed. 1049 (1902). The Patent Act provides that “[o]nly the Board of Patent Appeals and Interferences has the authority to grant rehearings.” 35 U.S.C. § 7(b) (1988). The Solicitor argues that the statute is ambiguous, that it is unclear what the composition of the “Board” must be for the “Board” to “grant rehearings” or to actually rehear an appeal. Therefore, this court should defer to the Commissioner’s interpretation of the meaning of this clause of section 7. However, the Solicitor presents conflicting impressions of the board and its role. On one hand, he argues that the board is not an independent body, but is simply an extension of the former power of the Commissioner to 1572*1572 directly hear appeals from decisions of primary examiners. The board is an alternative avenue through which the Commissioner may make “policy” decisions, of which as head of the Patent Office, he is the final arbiter. This being the case, the Commissioner has broad discretionary authority to designate, or redesignate, panels to keep the board from rendering decisions contrary to his policy. Therefore, the “Board” that either grants rehearings or rehears appeals is whatever collection of members the Commissioner chooses to designate at any stage of the proceeding before a final decision is entered. On the other hand, the Solicitor analogizes the board to a court. He says it regularly sits in panels of three, but is capable, as is this court, of sitting in expanded panels if certain criteria are met. He also compares the board to the Court of Appeals for the Ninth Circuit and its ability to sit en banc with less than the entire court. See 28 U.S.C. § 46(c) (1988); 9th Cir. Rule 35-3. The board also has this option, argues the Solicitor, and the use of limited “en banc” is discretionary with the Commissioner. The Commissioner cannot have it both ways. Either the board is a quasi-judicial body, deciding each case by applying existing law to the facts before it, or the board is simply an extension of the Commissioner’s office, making decisions on the basis of policy. I think the statute is unambiguous and that it unarguably vests the power to grant rehearings in the board itself, free from undue interference by the Commissioner. The patent board is not the “alter ego” of the Commissioner; it is an adjudicative body which functions independently and has its own separate and distinct authority. See Animal Legal Defense Fund v. Quigg, 932 F.2d 920, 928, 18 USPQ2d 1677, 1684 (Fed. Cir.1991). The Commissioner may only influence a decision when he sits as a voting member of the board and in this role he serves as any other member. Id. at 929 n. 10, 18 USPQ2d at 1684 n. 10. It is on this assumption that this court has routinely reviewed patentability decisions of the board on the same basis as it does those of a court. See, e.g., In re King, 801 F.2d 1324, 1326, 231 USPQ 136, 138 (Fed.Cir.1986) (“Our review of a finding of anticipation [a fact question] is the same whether it was made by the board or by a district court.”); compare In re Bond, 910 F.2d 831, 833, 15 USPQ2d 1566, 1567 (Fed.Cir.1990) (anticipation is a question of fact for the board reviewed under the clearly erroneous standard), with Lindemann Maschinenfabrik Gmbh v. American Hoist & Derrick Co., 730 F.2d 1452, 1458, 221 USPQ 481, 485 (Fed.Cir.1984)(applying same clearly erroneous standard to district court’s finding of anticipation); and In re McCarthy, 763 F.2d 411, 412, 226 USPQ 99, 100 (Fed.Cir.1985)(obviousness is reviewed for legal correctness without deference to the board’s determinations), with Gardner v. TEC Systems, Inc., 725 F.2d 1338, 1344, 220 USPQ 777, 782 (Fed.Cir.1984) (district court’s conclusion on obviousness “is one of law and subject to full and independent review in this court.”). The role of the board is also readily apparent from the history of the Patent Office. The Office’s primary task is to answer questions on the patentability of inventions. The Commissioner has the authority to promulgate regulations consistent with the patent laws to aid the efficient operation of the Office. 35 U.S.C. § 6(a) (1988); see Ethicon, Inc. v. Quigg, 849 F.2d 1422, 1425, 7 USPQ2d 1152, 1154 (Fed.Cir.1988). The Patent Office also has the responsibility to make individual determinations on patentability by examining particular applications. 35 U.S.C. § 131 (1988). Originally, these functions were colocated in the Office of the Commissioner, who had the authority to “administer” the Office as well as to act as the final stage of decision on individual applications by hearing appeals directly from the examiners. See M. Blommer, The Board of Patent Appeals and Interferences, 1992 AIPLA Bulletin 188 (October, 1992); P.J. Federico, The Board of Appeals 1861-1961, 43 J.Pat.Off.Soc’y 691 (1961) (summarizing the history of the board from its inception). Growth in the number of applications 1573*1573 and correspondingly of appeals, made it necessary to give the Commissioner help in hearing appeals. In 1861 the Board of Appeals was created, and the Commissioner was given the task of hearing appeals from this board’s decisions. 1992 AIPLA Bulletin at 190. The Act of March 2, 1927, set up the division of authority in the Patent Office essentially as it exists today by abolishing the appeal to the Commissioner and delegating the task of hearing appeals solely to the newly expanded board. The Commissioner was made a member of the board along with the First Assistant Commissioner, the Assistant Commissioner and the examiners-in-chief. SeePub.L. No. 69-690, 44 Stat. 1335 (1927). The act separated the administrative function of running the Patent Office assigned to the Commissioner, from the adjudicatory function of deciding individual cases of patentability, delegated to the board. This division was retained in the 1952 Patent Act. See 35 U.S.C. §§ 6 and 7. The additional requirement that “examiners-in-chief shall be persons of competent legal knowledge and scientific ability” suggests the board is to render its decisions on legal and scientific bases independent of administrative and policy concerns. See id. § 7(a). The independent character of the board comports with the arrangement of other adjudicatory bodies in the executive branch. For example, Congress has created agency boards of contract appeals and given them the authority to rule on disputes arising out of contracts between the government and private parties. 41 U.S.C. § 607 (1988). These boards preside over cases in which contract rights of private individuals and entities are directly pitted against the interests of the government. Likewise the patent appeals board resolves conflicts between individuals seeking exclusive rights to inventions and the government’s interest in promoting free exchange of technology. Both the board of patent appeals and the contract appeals boards function under similar grants of authority that, at least facially, are not limited by the authority of the head of the agency. Both bodies are in some sense, “designated” by their agency head, but this does not mean their decisions may be limited or controlled by that official. Historical and statutory notes explaining the authority of the boards of contract appeals state that the boards act independently, “not as a representative of the agency, since the agency is contesting the contractor’s entitlement to relief.” 41 U.S.C.A. § 607 notes; see also United States v. General Dynamics Corp., 828 F.2d 1356, 1364 (9th Cir.1987) (the “ASBCA is intended to be independent of the Department of Defense,” and its function is “strictly quasi-judicial”). By virtue of its similar function and statutory authority, the patent appeals board cannot be viewed as a “representative of the agency” because the Patent Office, through the examiner, also contests the entitlement of the applicant by arguing for rejection of the patent application. 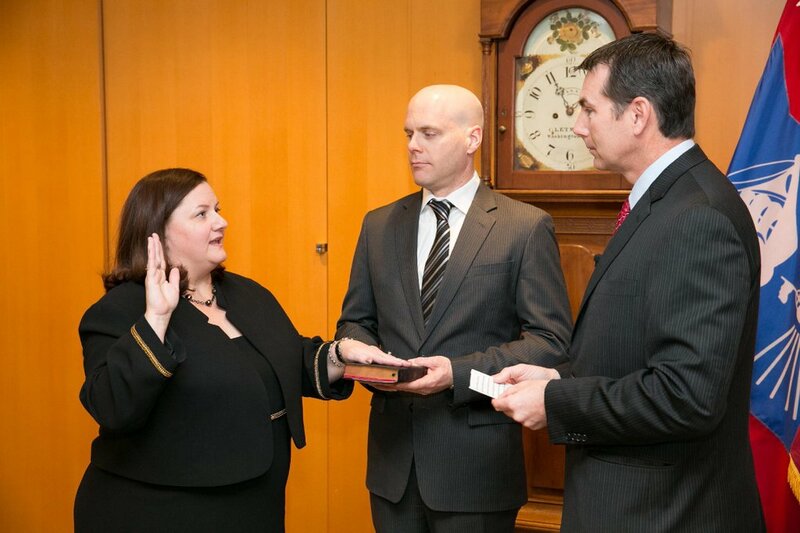 Molly Kocialski was recently sworn-in as the director of the Denver Patent Office. Director Kocialski was most recently in-house at Oracle. I always enjoy reading Michael Risch’s posts over at the Written Description blog. He has another interesting post titled “Do patents help startups?” Here’s the Link. You are currently browsing the 717 Madison Place blog archives for January, 2016.